Trying to create sucrose free candy / sweets is not an easy feat as fructose works in a completely different way to sucrose. Fructose is a monosaccharide which means it is made up of a single unit. Sucrose is a disaccharide made up of glucose and fructose. I first attempted to make nougat by using only honey in this recipe. It was very tasty but did not set very well. When I made my salted caramel I realized that the glucose seems to stabilise the fructose and so I used Jackie Cameron’s recipe as a base to make my sucrose free nougat as she uses glucose in the recipe. I learnt that you cannot heat fructose to the same level as sucrose, and hence my brilliant caramel colour. In the recipe I am sharing I have listed a lower temperature for the syrup than what I took the syrup to. This tastes unbelievable though, and I am so glad I was challenged to make nougat again. I have a huge tray to enjoy which will bring me great pleasure over the next couple of weeks. My best tip for you if you try and make this recipe is to make sure you beat the egg whites to the perfect peak and if you need to know more about how to do this, take a look here. Cut into desired sizes and enjoy! The March 2014 Daring Bakers’ challenge was hosted by Rebecca of BakeNQuilt. She challenged us to learn to make classic nougat and to make it our own with our choice of flavors and add-ins. This nougat is not sugar free at all, infact it has quite alot of sugar in it. I should have probably called it sucrose free to make sure that I was understood clearly! I love nougat and yours looks delicious! That looks gorgeous! I can’t believe it’s sugar-free. This is one that I’m definitely trying out. Big Man adores nougat – maybe I should try to make this for him! I hope he likes it! These are gorgeous, I am making these this week-end. Love it! Thank you for that Cheri, hope you enjoy it! Homemade nougat? 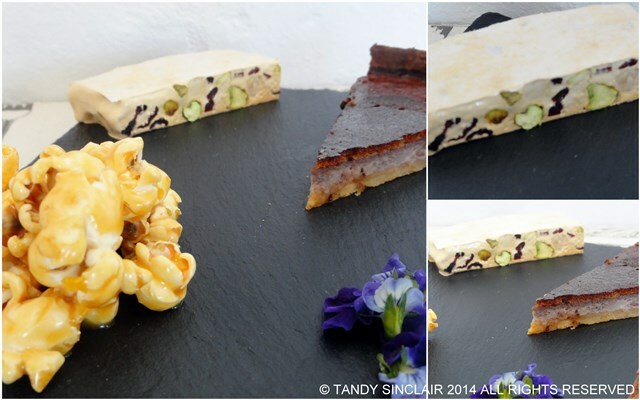 Amazing Tandy…I love the idea of the nuts, cranberries and the rose water in it…yum! Your nougat looks fantastic Tandy! Sounds absolutely divine!! I love nougat, and you make it look ‘doable!’ 🙂 Seems like we are on similar wavelengths this week because I was planning on trying to make/bake a sugar-free gluten-free dessert this weekend. I’m not sure what yet, and it sounds near impossible, but we’ll see what happens. I only wish they sold sugar-free gluten-free treats in the shops. It’s always one or the other. I think you have pulled off the huge feat as this nougat looks delicious and love pistachios and roses. It’s almost like an early Mothers day recipe.